Descended from larger herding dogs, the Pomeranian is a spitz-type dog that is now a companion and show dog in the toy group. Its small size makes it a great choice for apartments or houses with small yards as it doesn’t need much exercise, but the small dog is very energetic and requires attention from its owners. The Pomeranian’s popularity began in the late 1800s with British royalty and continues to this day. The modern breed is believed to have developed in a region of northern Germany and Poland that is known as Pomerania, and that it was used as a herding dog. In this working form, the breed was approximately 30 pounds (and perhaps weighed as much as 50). The early iteration of the breed, which came from the German spitz, worked in harsh northern climates (even earlier versions were used in the arctic) and gives the current breed its thick double coat, which protects it from the cold, wet, windy elements. Pomeranian popularity soared in 1891 when Queen Victoria showed a small, 12-pound dog named Windor’s Marco. The smaller size immediately became all the rage and breeders began selectively choosing mates based upon their miniature dimensions. It is said that the Pomeranian’s size decreased by more than half just during the queen’s lifetime. Despite the morphological changes, Victoria worked to better breed health by importing small Pomeranians of various colors from several European countries – a ramification being that today’s dogs come in more colors than just about any other breed. Modern Pomeranians weigh between 4 and 7 pounds and stand 5- to 11-inches tall. They have a distinct spitz look: thick double coat, fox-like pointed nose and ears, as well as a tail that curls over their back. The thick coat requires regular grooming, and will shed prodigiously. Alert, friendly and energetic, Pomeranians are playful and enjoy being with their owners. They have a tendency to territorial and to bark, and while that’s good for alerting owners to the approach of strangers, without proper training the sounding of the alarm can become constant. Intelligent dogs that respond well to positive reinforcement, Pomeranians continue to be popular companions – ranking in the top 20 of breeds for more than a decade according to the AKC. Interesting Pomeranian facts include: the first breed club was established in England 1891, and the first Pomeranian in America was registered in 1898. A Pomeranian won the Toy Group at Westminster in 1926 but didn’t win “Best in Show” at the event until 1988. Perhaps most interesting, in 1912 two Pomeranians were among only three dogs to survive the sinking of the Titanic. 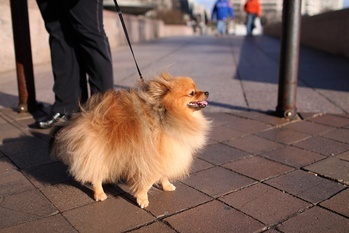 Pomeranians enjoy a fairly long lifespan of 12 to 16 years, but have one of the lowest litter sizes – typically averaging between two or three puppies. They can suffer from early tooth loss, luxating patella, tracheal collapse, issues related to the breeding of merle dogs and alopecia. At Paw Print Genetics, we offer a three-test Pomeranian panel that includes degenerative myelopathy, gallbladder mucoceles and hyperuricosuria. If you’re planning on breeding your Pomeranian, or are looking for a “Pom Pom” puppy, be sure to select from dogs that have been screened for those three known mutations so as to avoid the ramifications and impact to quality of life associated with those diseases.